First, my fiance and I went to this lovely pumpkin patch to find the perfect size pumpkin. For this project I use a small/medium sized pumpkin. Now, if you want to keep your work to use next year, I suggest going to Michael’s or a craft store that sells fake pumpkins! For this project I used acrylic paint, but I have found it to be easier to just use spray paint. And as always, I am so impatient and use a hair dryer to help speed up the process. Be sure to use several coats on the pumpkin. I painted the bottom and the front of the pumpkin that I was going to be using first. I found that it’s better to do it this way then paint the back of the pumpkin last so the paint doesn’t rub off when it is on its side as you are working. Now for whatever logo or monogram you are going to use for the front, just simply print out what you need and size it to how you want it. Tape it to the front of the pumpkin, and with a pen trace over the outline of the image. Press hard enough to leave a mark in the pumpkin. Once traced, I suggest painting the inside of the image with the same color paint as your glitter. This is so there is no white space behind your glitter and it looks fuller. For example, I used gold paint to fill in the “FS”. Once the paint is dry, pour a dab of clear Elmer’s glue on a plate and use a small brush to paint the image you have on the front of the pumpkin. Be sure to cover all edges. Sprinkle your glitter over your image generously. Then, shake off the pumpkin, and blow off any loose glitter that is surrounding the image. Next, take a spray adhesive and spray the glitter and the pumpkin. Finally, find some floral ribbon that you want for your pumpkin, and decorate it to your liking! I used hot glue to secure down my bows and ribbons. 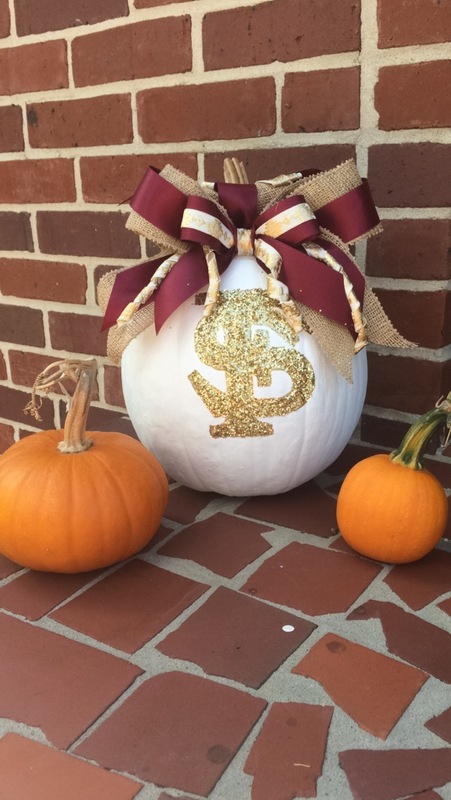 My fiance carved a matching Bobby Bowden pumpkin!